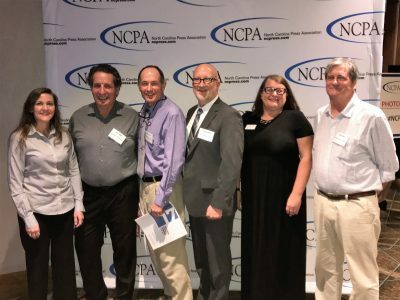 RALEIGH – Coastal Review Online won a dozen awards Thursday from the North Carolina Press Association for news coverage during 2017. The association announced the awards during the news, editorial and photojournalism contest awards ceremony that was part of its annual convention held this year at the Raleigh Marriott Crabtree Valley. Awards were presented to newspaper and online journalists from across the state. Coastal Review Online staff, reporters and photographers competed in the online-only division of the association’s annual competition. Among the awards for the nonprofit news publication’s work were six first-place awards, including one for best use of multimedia. The team also received two second-place awards and four third-place awards. The contest period was for stories published between Oct. 1, 2016, and Sept. 30, 2017. 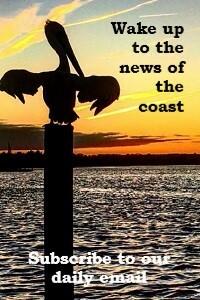 Coastal Review Online is published daily, Monday-Friday. The North Carolina Coastal Federation launched the nonprofit news service in February 2012 to provide coverage of issues relevant to the people, culture, history and environment of the North Carolina coast. Coastal Review Online has been a member of the North Carolina Press Association since 2013. The association’s winter convention typically includes guest speakers and education sessions for journalists, such as information on open government and laws pertaining to public records and media. The editorial contest is open to any North Carolina newspaper or online news site that is a member of the association. The Hoosier State Press Association judged this year’s contest entries. Coastal Review Online earned awards in a variety of categories, including breaking news coverage, in-depth government reporting, feature writing and columns. Staff took home a first-place award for online breaking news coverage during and immediately after Hurricane Matthew struck the North Carolina coast in October 2016. Reporting included regular updates on conditions, flooding, damage and the emergency response up and down the coast and tracking coordinates during the weekend storm, which was blamed for nine deaths in the state, and a detailed report with photos on that Monday morning when Matthew turned away from the Outer Banks and headed out to sea. 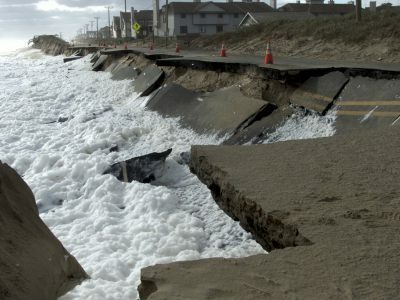 Coverage of Hurricane Matthew’s aftermath also included a front-page featured photo of the damage to a portion of N.C. Highway 12 on the Outer Banks. That image, captured by Kip Tabb, earned a first-place award for spot news photography. Kirk Ross and Trista Talton took home awards for their election/political reporting and city/county government reporting, respectively. 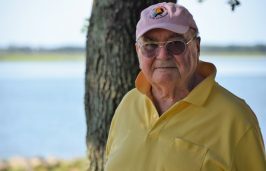 Talton’s series of news reports articles arising from a dispute in Topsail Beach, North Carolina, regarding a development rule intended to protect vulnerable sand dunes. 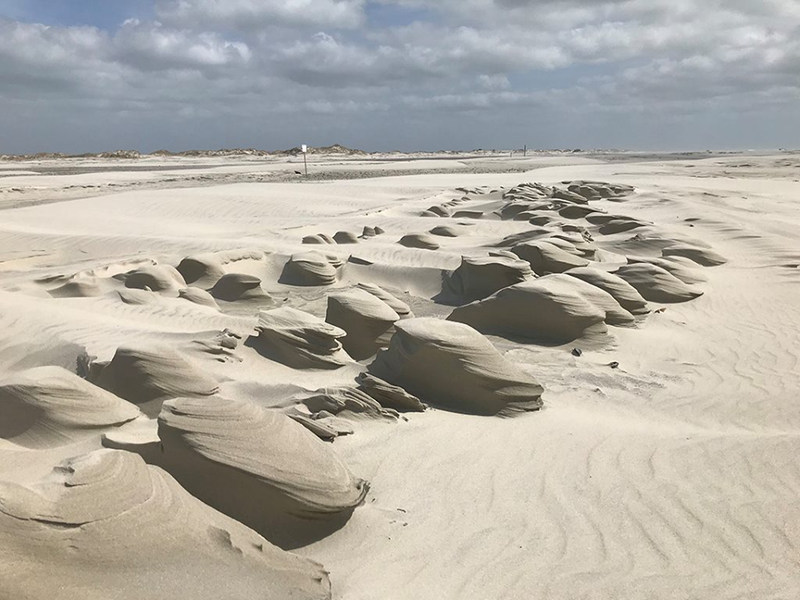 A handful of property owners frustrated that the restrictions prohibited development of their parcels faced off against others who feared that altering the dunes would weaken them, creating increased flooding threat to their homes. A legislative provision aimed at resolving the dispute was part of House Bill 56, which ultimately cleared the legislature, was vetoed by the governor but then became law when the General Assembly overrode the veto. Jared Lloyd, Lighter Columns, multiple entries. Mark Hibbs, Headline Writing, multiple entries. Trista Talton, City/County Government Reporting, multiple entries covering Topsail Beach’s battle over dune-protection issues. Sam Bland, Lighter Columns, multiple entries.